Sweet Pea LOVES hide and seek. She loves playing it, and she loves books with it. She also loves cats. So when we stumbled across Where's the Cat by Stella Blackstone at the library it was instant love for her. After keeping it for 3 months, we'd exhausted all our renewals of it. 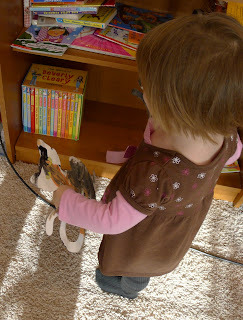 Then after we returned it to the library, Sweet Pea saw it there again...and it's back at our house for a month or two...or three. The cat is playing hide-and-seek, so you can only see a small part of it on each page. Then on the next page, it shows you more of where the cat was hiding. 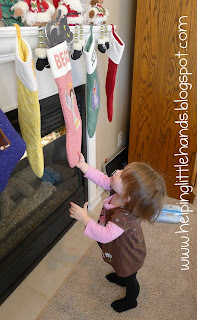 Since she loves it so much, I thought we'd do a preschool activity with them. Remember our Hero/Halloween Cats we made several months ago? They were still in our window through the holidays. I figured it was time to pack them up with our fall decorations, but first I hid them in several different places around the living room. 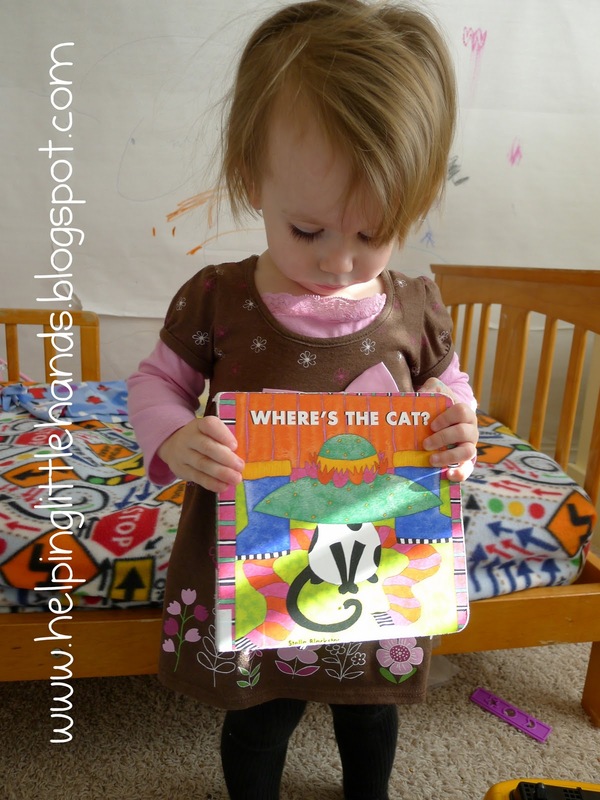 Then we read "Where's the Cat" and I had the kids go looking for the hidden cats. I put words on the back for Little Brother to sound out, but he was so excited about finding the next cat, I couldn't get him to focus on those. This was a really simple activity to throw together. If you want to cut out your own cats, you can find my printable here or I'm sure a quick image search would turn up lots of other possibilities. These are simpler than the regular I Spy books. There are usually just 2 things on each page to look for and it's just the right amount for her. Goodnight Gorilla is another favorite because there is a mouse with a banana and a balloon to look for on every page. 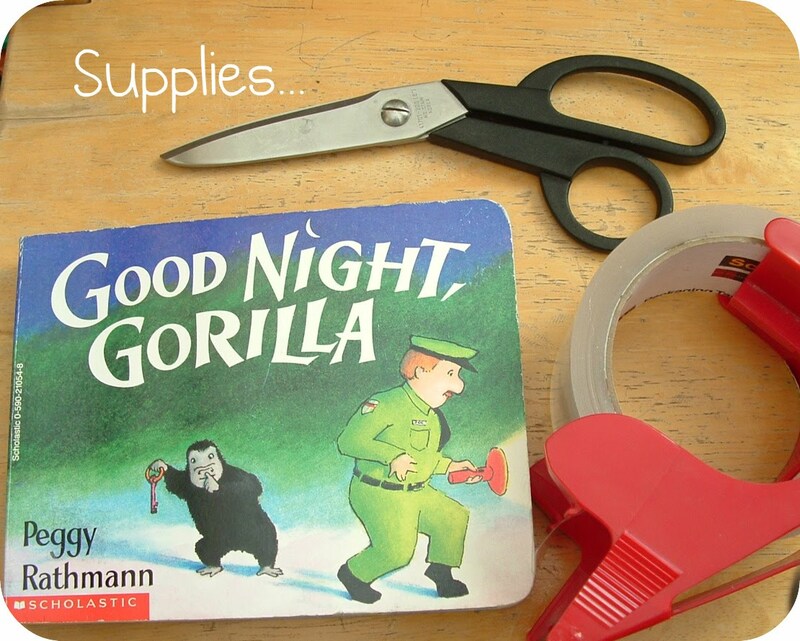 Goodnight Gorilla is also great for kids just barely starting to read because there are only a few words and they're very repetetive. I'd love to hear what other books you know about that have recurring items to look for on each page, so we can find them at the library or add them to our collection. And while we're on the subject of kids books and since I lifted the Goodnight Gorilla picture from this post, be sure add mailing tape to the spines of those boardbook or paperback books your kids got for Chirstmas. They'll last a lot longer. There's a little mouse to find on each page of Goodnight, Moon. 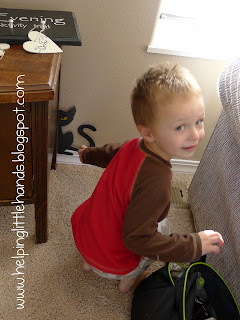 What a darling activity to hide the cats around the house. I'll bet the kids loved it. When my toddler wants a book as much as that (you know, three months of renewal time), I just buy him the book:) Then he'll have a collection when he grows up of all his toddler favorites. He's acquired three books this way. Fun idea. Lots of Usborne books have a duck hidden somewhere on the page. I know the Farmyard Tales series, Castle Tales series, First 100 Words and First 1000 Words all have a duck hiding on each page, and the "That's Not My..." series has a mouse on each page. The book "LMNO Peas" has a lady bug hidden on every page. Fun, rhyming alphabet book. The kids love it and I don't get tired of reading it. Richard Scarry's Cars and Trucks and Things that Go!! It's probably a little too hard for Sweet Pea, but I think it would be appropriate for Little Brother, especially with his love of cars. Goldbug is hiding somewhere on each page, and on most of the pages, you can see Dingo the bad driver and Officer Flossie (who is chasing him).